Note, the valve and pressure gauges shown in the above are part of the experimental setup only. This system is used to study thermal transpiration as a time-dependent phenomenon; from an initial stationary state where only a thermal-transpiration flow is allowed to develop (pc ≈ ph ≈ const. ), to a final stationary state where the net mass flow rate in the channel was zero. This final state is reached by allowing pc and ph to evolve (by closing the valve), resulting in the generation of a pressure-driven flow which opposes the thermally-driven flow. A full molecular treatment is computationally intractable, reinforcing the need for the IMM. 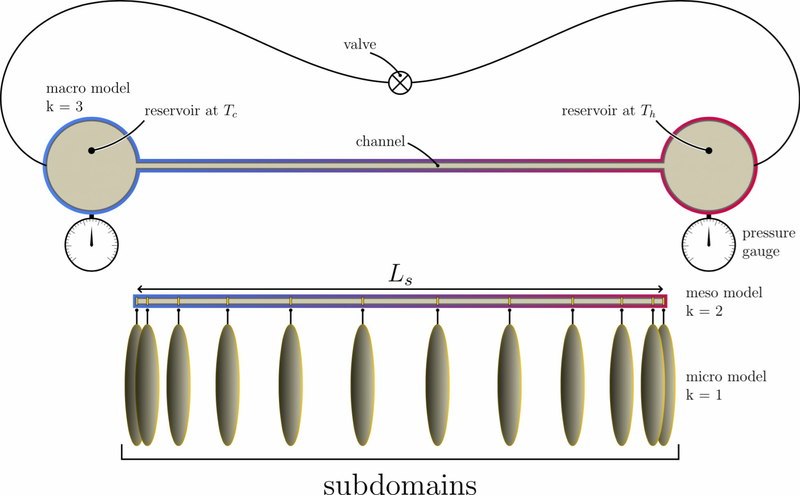 The IMM manages to capture the transient response of the pressure in each reservoir after the system is instantaneously closed; as shown in our 2015 paper there is excellent agreement between the experimental measurements and the multiscale solutions. Currently, the IMM running on a hexa core CPU requires a little under an hour to provide these solutions – we have an efficient and accurate method to study thermal transpiration and inform the design of devices that make use of this phenomenon, e.g. Knudsen compressors.